Finished – 4 colour print. This winter I’ve been working on lino prints being used to make lampshades. I’ve also become quite addicted to gold leaf and seem to need to put it on to each lino print! probably missing the sunshine of Summer. There are several exhibitions coming up, too many really and the pressure to make new work has made me prevaricate, always a fan of procrastination, I started doing lampshades to delay making new prints, knowing that once I had work to frame, I would have to get on with that and framing has become the sticking point. I enjoy it but I need a chop saw and can’t afford one! Trying out my new Ternes Burton registration system, where pins are attached to the board that has the block (to be printed), fixed on. Then the tabs are stuck with masking tape to each piece of paper to be printed – Ensures each colour gets printed in exactly the right place – very pleased, not so pleased with the Three Hares print – the moon needed more thought but it was all an experiment, using gold, silver and the tabs so pleased with the learning! Need to lose some weight! 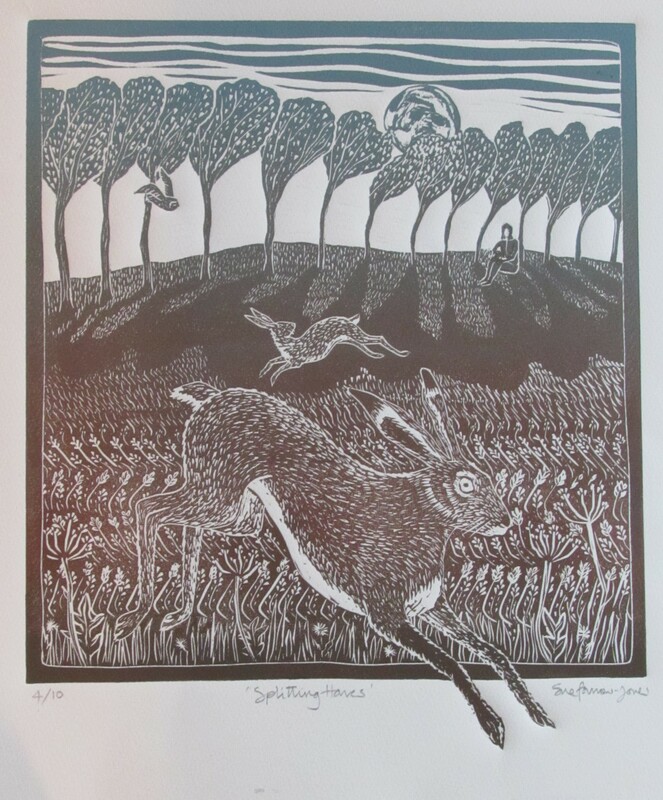 My latest lino prints are a series of three prints based on the story of Melangell, the Celtic Patron Saint of hares. She was a 7th Century daughter of an Irish Chieftan, who fled to Wales to avoid a marriage to an elderly landowner. She was out walking when Prince Brochwell, Prince of Powys, was out hunting with hounds, pursuing a hare, saw the hare take cover under Melangell’s cloak. He called his hounds off as he admired her courage. He gave her the valley as a place of sanctuary, and Melangell became Abbess of a small religious community. After her death her memory continued to be honoured, and Pennant Melangell has been a place of pilgrimage for many centuries. St Melangell’s church contains her shrine and in May each year visitors gather to remember her. She continues to be The Patron Saint of hares. 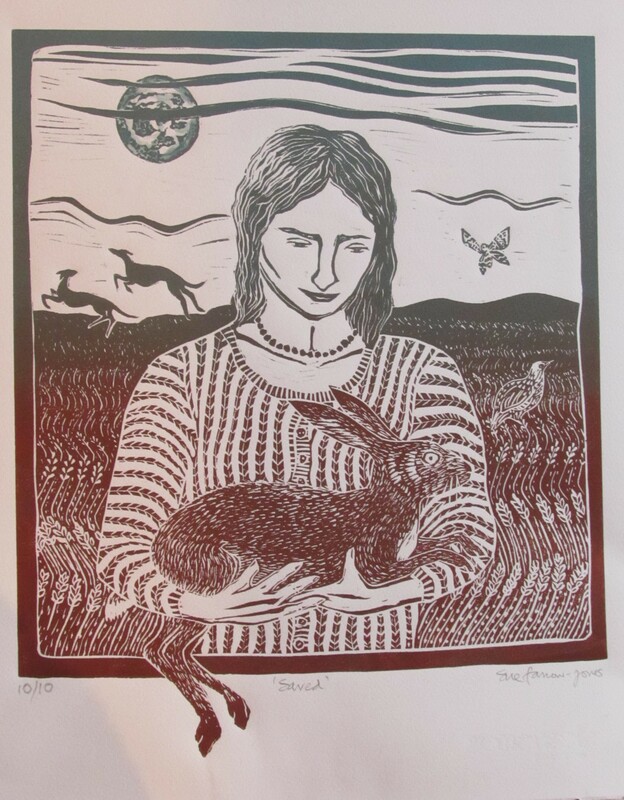 This first print shows a Woman rescuing a hare from the cruel sport of hare coursing. She holds the hare and fortunately the hounds run off. ‘Saved’ A woman rescues a hare from hunting hounds. The next print shows the hare, some time later, being safely released and joining another hare. 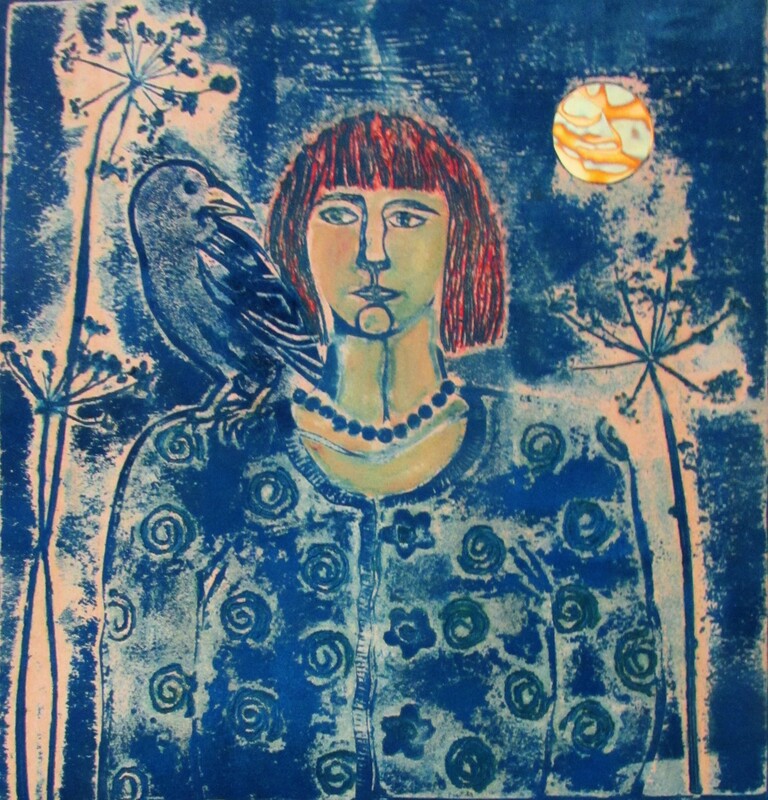 The final print shows the owl that has been in the background, flying nearer over the now empty corn field, both the Woman and the hares have gone. 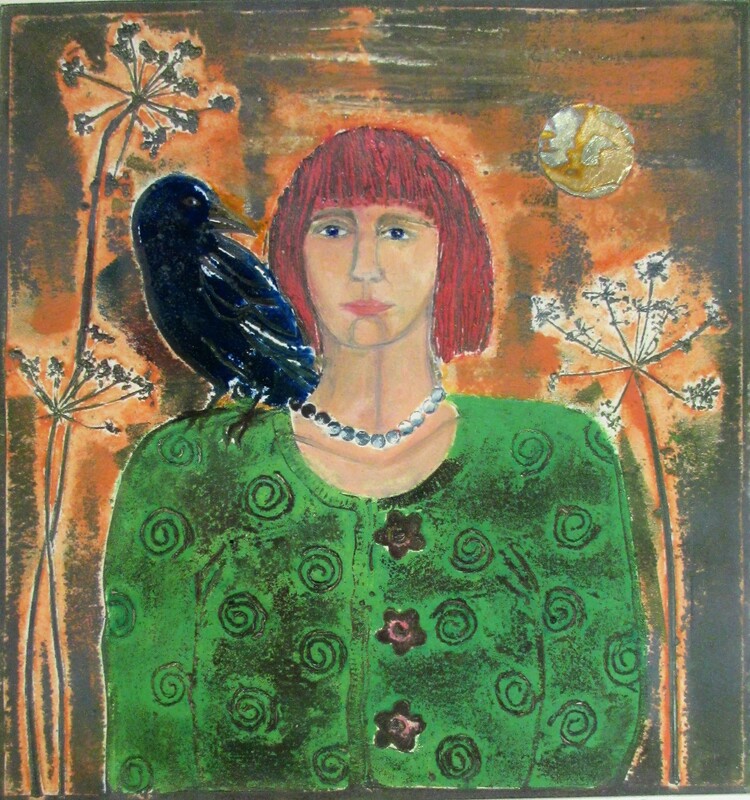 ‘The Crow Woman’s Green Cardigan’ Collagraph. 30 x 30. Edition of 5. This was my first attempt at a collagraph. Sold. ‘Lime Washed Dovecote’ Lino print. Designed as a fabric print. 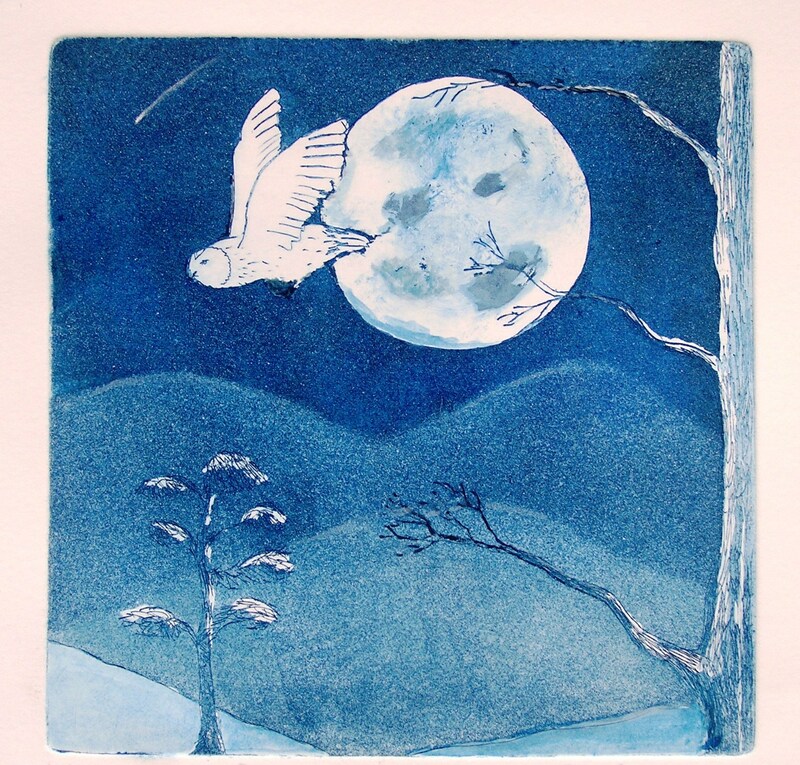 ‘Fly-By-Night’ Etching. 20cms x 20cms. edition of 30. Available as a framed print £75. or unframed £50. ‘Swallows at Dartington’ Etching. Edition of 10. 25 x 36 cms. Unframed £45. 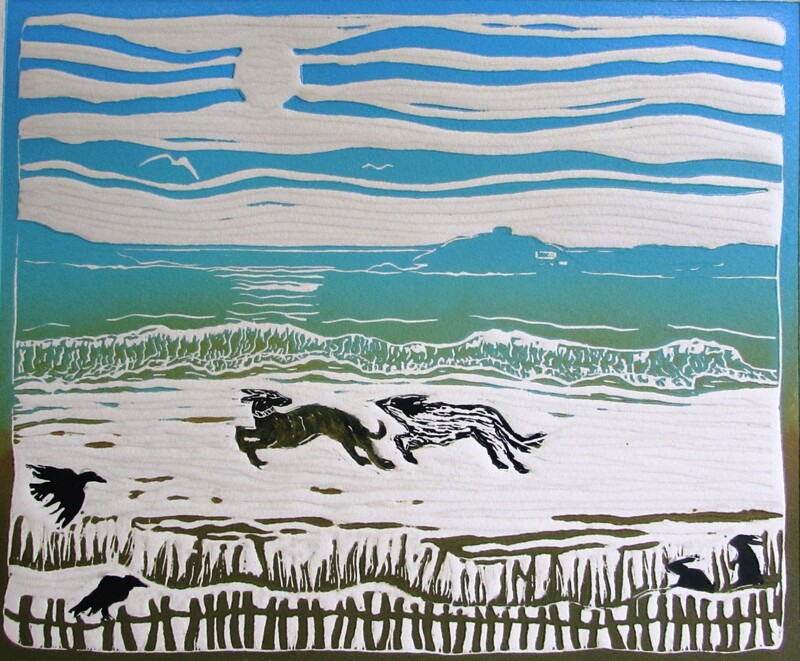 ‘Early Summer Morning, Bantham’ Lino print. Edition of 20. 46 x 36 cms. Unframed £65. 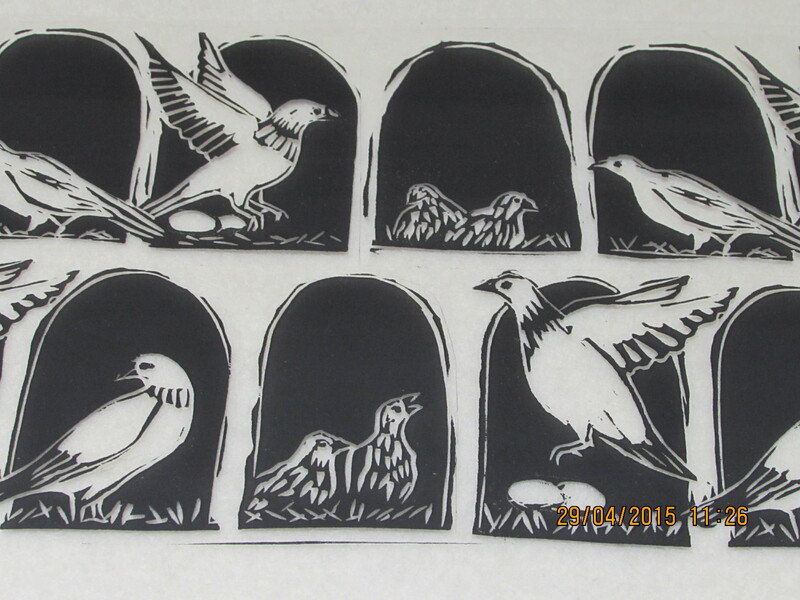 ‘Jackdaws at Albemarle’ Lino print. Edition of 10. 30 x 25 cms. Unframed £40.